Despite going to college an hour from Montreal – and frequent visits during that time – I’d never been to the jewel of Quebec – Quebec City. I’d heard great things about it, from fantastic food to friendly people and amazing vistas. Finally, I just got a chance to explore it myself. I was asked to speak at a conference in Montreal on Friday December 6th, late enough in the day that it would be impossible to get home to San Francisco until Saturday. And as the scheduling gods would have it, I needed to be at Discovery Headquarters on Monday to participate in our first-ever social summit, which would have entailed travelling BACK to the east coast on Sunday. 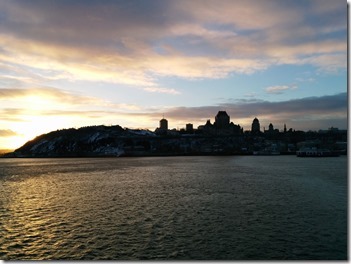 But Quebec City beckoned – even though the cold of December loomed. So Friday late afternoon I hopped on a train from Montreal to Quebec, to finally experience this pretty city on the St Lawrence river. The train itself was a lovely experience. Even in economy class, Canada’s ViaRail coaches only have three seats abreast, and I ended up with the single seat next to an expansive – and clean – window. There’s not much to see as the train doesn’t hug the river, but it was getting dark anyway. I ended up catching up on work with the free WiFi during the three hour jaunt from Montreal to Quebec City. After dropping my bags at my hotel – the comfortable and definitely recommended Hotel Le Germain Dominion, I headed off to old town for a quick walk around and a bite to eat. Quebec City really is a taste of Europe in North America. First, it’s the only walled city north of the Rio Grande, circled by battlements that are three hundred or more years old. And since it’s the heart of “New France”, French is not only the official language, it’s spoken predominantly by just about everyone. From the first steps out of my hotel I felt like I was in a northern European town, not a city a hundred miles north of Maine. Climbing up the long and winding road to the old town was great exercise. 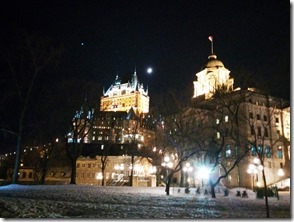 and as I crested the hill, the magnificent Chateau Frontenac revealed itself bit by bit. One of the magnificent Fairmont hotels built to support Canada’s coast-to-coast railway, it’s easily as beautiful as the one in Banff and Victoria. 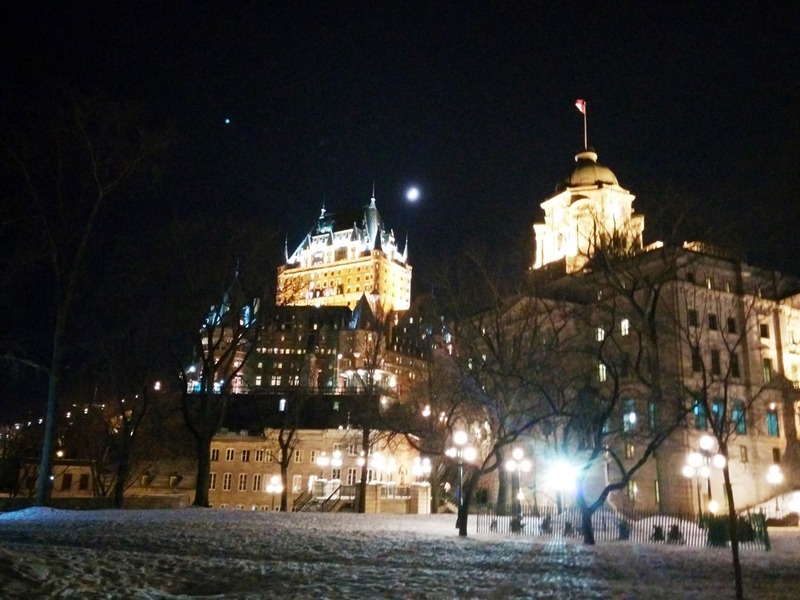 And it dominates Quebec City – you can see it from just about everywhere. Unfortunately it’s not really much fun inside – at least not now. I was looking forward to having a drink in the supposedly great lounge overlooking the river, but alas it was closed for renovations, which meant either huddling in the basement or pushing on – and I opted to walk around. I ended up having an AMAZING dinner at Initiale – about 3 blocks from my hotel. Amazingly fresh, delicate and sublime, I feasted on King Trumpet mushrooms, scallops and venison – sauced and enhanced by root vegetables, balsamic vinegar, brussels sprout leaves, dill and much more. Saturday morning I awoke energized and ready to explore. The good news: it was sunny and clear. The bad news: the temperature had dropped to about 20 degrees tops. 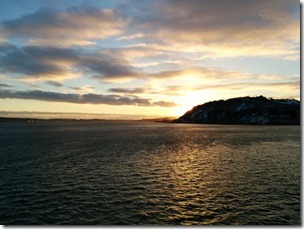 But undeterred I bundled up and headed out on an epic 4 hour walk around the battlements, the walls and the governor’s promenade – an amazing walk around the citadel overlooking the river and with amazing views of islands and mountains in the distance. 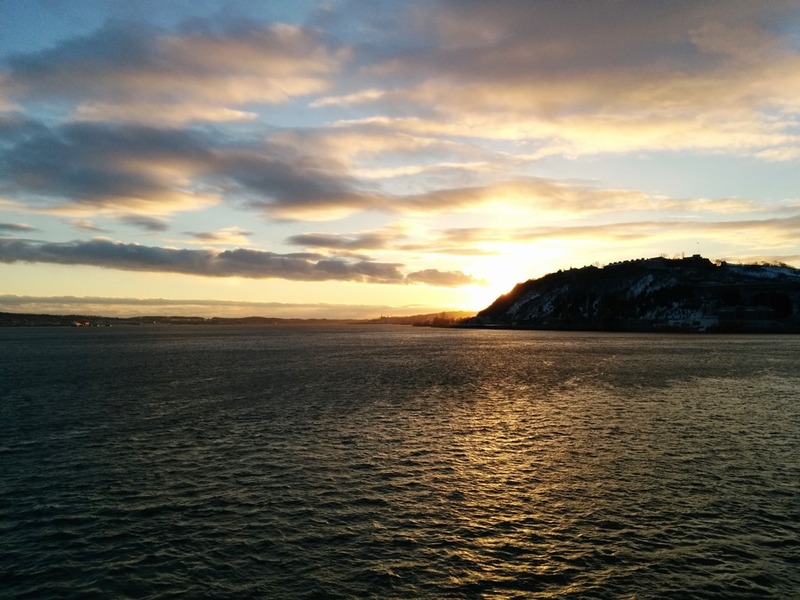 Plus, because the “promenade” – really a set of stairs and paths that hug the cliffs alongside the citadel walls just past the Chateau Frontenac – faces south, it was actually almost not cold. One of the joys of visiting great places in the off-season is you often have it mostly to yourself. Although I’d love to see Quebec City in the summer, when Parisian-style cafes tumble down along the beautiful squares of the old city, I certainly enjoyed not being shoulder to shoulder with other tourists. 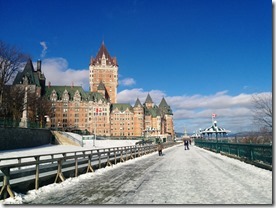 As I walked the ramparts, I passed maybe 4 other people – I basically had the city to myself! After wandering the city for a few hours, I decided to warm up in the Museum of Civilization – a sprawling three story set of collections that I really enjoyed. I’m not sure exactly what the mission of this Museum is – it included permanent displays on the evolution of Quebec and the Inuit natives. But it also featured fascinating posters and paintings from Paris, a video-game retrospective sponsored by Montreal-based game developer Ubisoft and an exhibit of voodoo art from Haiti. Definitely also recommended! After an hour or more there, it was approaching 3:30, and as the sun was starting to set I walked across the street to the ferry terminal – hoping for a sunset sail on the St Lawrence. I was not denied. 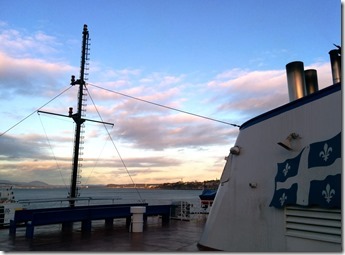 The Quebec City – Levais ferry heads off on its 10 minute run across the river every half hour, and for $3.50 you can ride over and back, taking in the city and the river along the way. 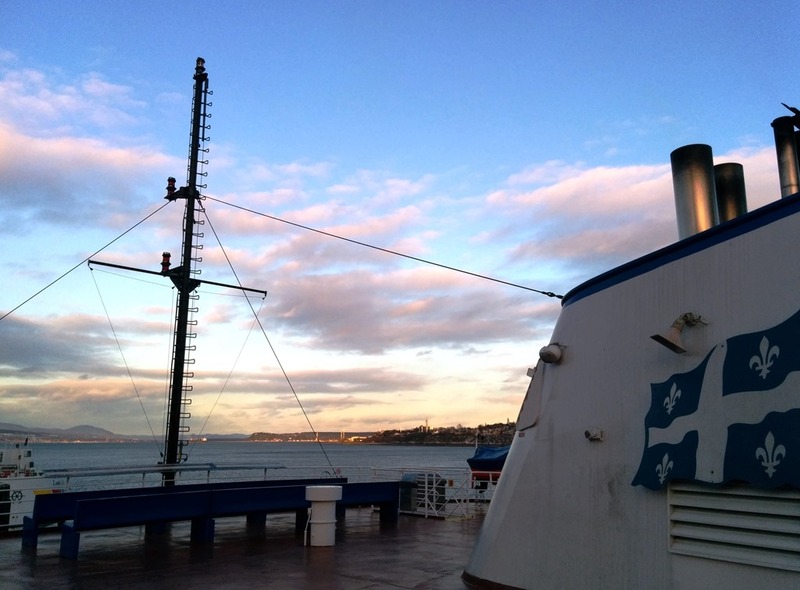 It’s a great way to see the city – and sunset was a perfect time to make the trip. It wasn’t warm though. I bounced back and forth between the open-air deck and the warm cabin, sipping machine-made coffee for both energy and warmth. It was well worth it though. The views were wonderful, and as the sky darkened he city began to sparkle like an icy jewel, as the lights came on up along the cliffs and on the walls and the chateau. 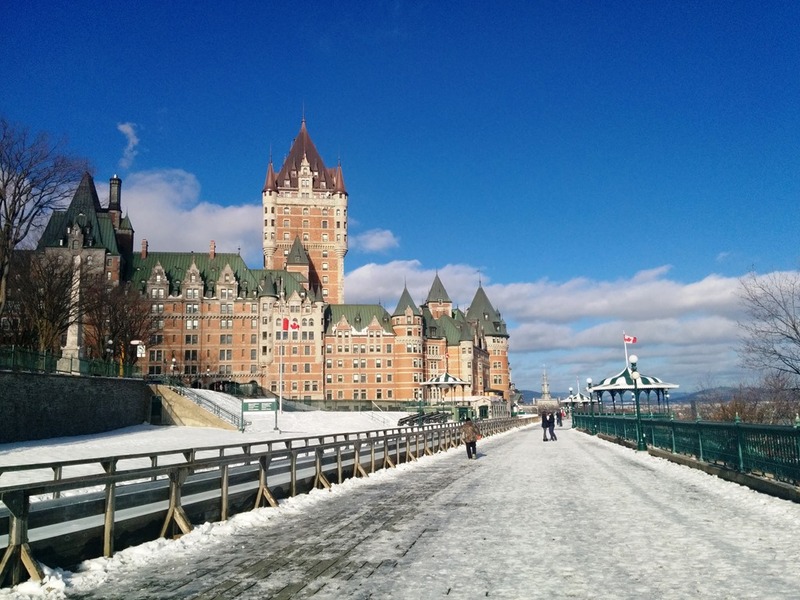 If you’re headed to Quebec City, get ready for a very European experience. The food is great, the people friendly and the views and the old town are amazing. Although it was cold, December does have a lot going for it. The entire town is decked out in Christmas lights, there’s a great German-style Winter market in front of City Hall and the Notre Dame cathedral, and you can get into every restaurant and attraction without waiting. But it’s definitely cold. What Calvin and Hobbes Taught Me About Big Data! But imagine if you added some great photos or video clips to give your posts more, “pop”! Your content is excellent but with images and video clips, this blog could definitely be one of the very best in its field.